They come from a long line of fishing families. They still fish the traditional underwater troughs and canyons, with the traditional gear. But they are watching the industry struggle. As quotas are lowered, and fishing days are reduced, it gets harder and harder to make a living the way their fathers and grandfathers did. The fishing heritage in Menemsha is in danger of slipping away. But like any good businessmen, Alec Gale and Tim Broderick keep their eyes open for opportunity, for ways to adapt from a struggling segment of the fishing industry to one that is growing. So even though it is a lot of work, and a lot of risk, when the chance came to learn to grow and harvest mussels, they jumped at the opportunity. While it is still in the experimental stage, mussels are growing right now off Chilmark’s north shore, with other areas set aside off West Tisbury, and Aquinnah. By midsummer, the two men expect to be harvesting the blue mollusks to supply local restaurants and seafood wholesalers. The town of Chilmark, and just about everybody in it, wants a sustainable fishing industry to survive. In order to fish, the two men needed some space on the Menemsha harbor waterfront, to store gear and land their catch. The harborfront lots are leased by the town at a nominal fee, and only for commercial fishing uses. They rarely change hands. Mr. Broderick made a proposal to the selectmen that started the wheels rolling. There was a joint meeting of selectmen and the parks and recreation committee. Then Louis Larsen stepped forward. He offered to give up his lease on a waterfront lot, so the town could rent it to Mr. Gale and Mr. Broderick. “Mr. Larsen made a good gesture,” said Tim Carroll, the town’s executive secretary. The two men now have a base to work from, and the town has moved a step forward in its efforts to preserve the fishing industry. The mussel farming operation began as a partnership of researchers, government, and fishermen. Rick Karney of the Martha’s Vineyard Shellfish Group orchestrated the permitting and planning here on the Island. Scott Lindell, director of the scientific aquaculture program at the Marine Biological Laboratory in Woods Hole, won grants to study how well mussels would grow in southern New England waters. The experiment was also designed to test whether pea crabs, a mussel parasite, would affect production. The science is not yet complete, but the group is able to make some conclusions. According to Mr. Lindell, 80 percent of the mussels that Americans consume come from Canada, Europe, even New Zealand. The bulk of those come from Prince Edward Island, where it takes two years to grow a mussel to market size. “We can grow mussels twice as fast here in southern New England than they can in Prince Edward Island. We have large domestic markets here. We should be able to be beat them not just on production costs, but on distribution,” Mr. Lindell explained. The study of pea crabs was also good news. So far there has been no significant infestation. Mr. Gale and Mr. Broderick are pouring sweat equity into the project. They set lines, manage gear, and collect samples for the scientists. They don’t get paid for their time, but they receive some reimbursement for the use of their boats. Each day on the mussel project means a day away from fishing and a significant loss of income. In return for their effort, when the experiments are finished, they will inherit the gear and the mussels that are growing on the underwater lines. The system used at the mussel farm was developed at the University of New Hampshire. It is designed to avoid gear and turf conflicts while providing optimum growth conditions for the blue mussel. 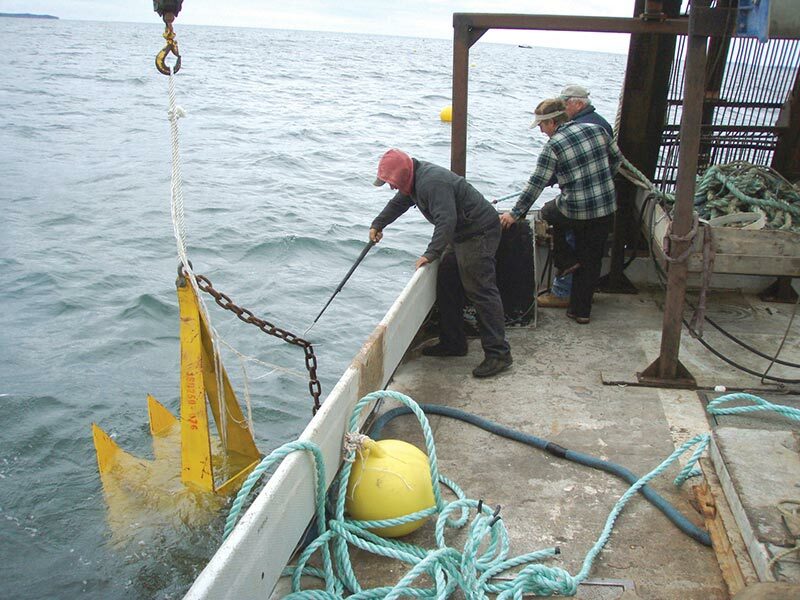 On the surface, all that is visible of the system are three buoys, two of them tethered to an anchor and one attached to the center point of the “backbone” for raising it to the surface. A longline is suspended between lines attached to two buoys set 600 feet apart. The longline is anchored at each end and suspended by submersible floats at mid-depth, about 40 feet below the surface in the Vineyard version. The longline acts as a backbone for a series of looped grow-out “socks.” Seed mussels are poured inside the socks, the outside of the sock deteriorates, and the mussels cling to the plastic rope inside the sock. The fishermen and the scientists are working now to determine the optimum amount of seed mussels to stock inside each sock. Mr. Lindell estimates that 10,000 pounds of mussels can be grown on each line, and there is room in the designated area to anchor more than 30 lines. There are two lines set up right now. The aquaculture project turns the risky equation of fishing upside down. Traditionally fishermen invest a lot of time and equipment to venture out and hope they net a good catch. The production can range from an empty hold to a full hold. In mussel farming, if the fishermen can get the production and marketing right, then they can simply take orders for a certain amount, then go out and harvest them.